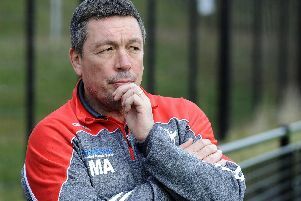 Sheffield Eagles have made another positive step to moving towards a full-time outfit following the appointment of Chris Jolley as commercial manager. With a new stadium on the horizon and the return of former favourite Keith Senior on a full-time contract at the start of the season, the Eagles are putting their long term strategy in place to eventually return to Super League as a full-time club from top-to-bottom. Jolley, the former commercial chief at Stockport County FC, has joined the Eagles’ flock as the club looks to maximise their commercial revenue ahead of a potential return to the Steel City in 2016 or 2017. “We are thrilled Chris is joining the Eagles,” said Director of Rugby Mark Aston. Jolley, who lives in Sheffield, will begin his role with the Eagles on July 1 and leaves Stockport after eight years with the Hatters, but will still be involved with the club on a voluntary basis on matchdays. eanwhile, the Eagles will be keeping their fingers crossed on the fitness of winger Rob Worrincy after he picked up a back problem in the 58-18 defeat against pace-setters Leigh Centurions at the weekend. The former Halifax man has played a key role in the Eagles rise to third place in the Kingstone Press Championship, and Aston will be hoping that his injury isn’t serious as they look to return to winning ways against struggling Workington Town at Castle Park this Sunday. “Rob Worrincy pulled up with a sore back and we’ll have to have a look at that,” said Aston. The game on Sunday will be the Eagles last ‘home’ fixture at Castle Park before returning to The Keepmoat Stadium. They follow Doncaster’s clash with Whitehaven (3pm) with a 5.15pm kick off against Workington.